My Creator-Owned Graphic Novel is Now on Kickstarter! Have you ever had a dream? Have you ever wanted something so bad that it kept you up at night and made you feel even slightly nauseous when thinking about it for too long? Have you ever been so close to fulfilling a passion project that you’ve spent months, hours upon hours, and every last dollar on? Have you ever had a story you knew you had to tell and you knew were the only one who could tell it? Well, that’s where I am at this point in time with my graphic novel series, SEASONS. 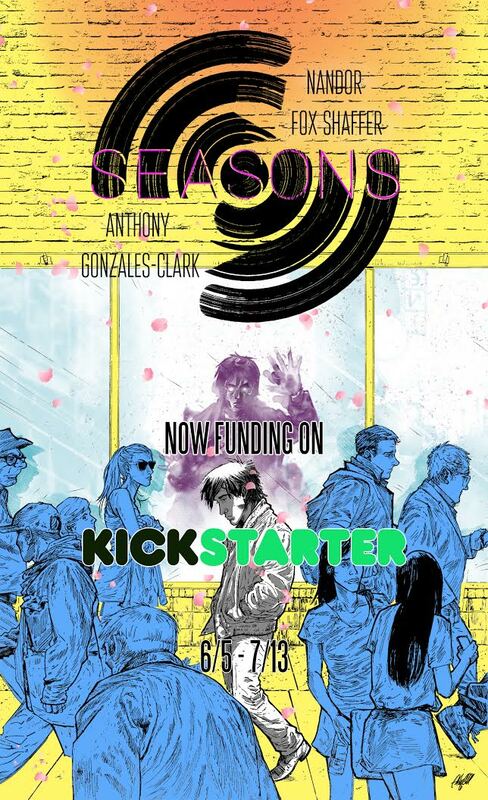 “SEASONS is an original, creator-owned comic book drama for readers who want be a part of a deep and serious one year journey that will challenge how they look at themselves, others and the world around them. The story of SEASONS revolves around one character, Fletcher Hart Iiams, a misunderstood, average young man who isn’t happy with his life anymore and has run away from almost everything and everyone. The entirety of this series will span over one year of Fletcher’s life as SEASONS is planned to be four separate but interconnected stories that follow the seasons of the year. The title has a two-fold meaning: the seasons of the year and the “seasons” people go through throughout their lives. There will be four graphic novel stories — Spring, Summer, Fall, and Winter — and each storyline deals with a combination of different obstacles, enemies, themes and problematic situations the main character will have to face all set in real time. Fletcher is given a new set of powers with every seasonal transition as well; as the world changes, so does he and his abilities. It is an allegorical character study piece ultimately about finding a reason to live in this world that will drag you down with it if you let it. My name is Nandor Fox Shaffer and SEASONS is my independent, creator-owned passion comics project that I began creating and writing a few years back. Last September I launched the series at http://seasonsthecomicbook.com. I’ve been posting two pages of SEASONS weekly every Monday and Friday on the official site since, where anyone and everyone can read it entirely for FREE and with the hopes of garnering a healthy and continually growing fanbase. As of today, the entire first three issues of SEASONS are up on the official website to read, and the site itself is just shy of 10,000 views/visits. The fourth and final issue of the Spring story arc, the first in the series, is currently being posted as we speak. I need the total of $6,500 to print, ship and distribute 500 quality hardcover copies of this first book. It’s not a small amount, but I most definitely believe we can make this happen. As you can imagine, it’s not easy running everything by yourself. Trying to self-publish SEASONS has been one long — sometimes frustrating, of course — learning experience. By the time I’m done financing SEASONS Volume 1: Spring, I will have spent over $12,000 out of my own pocket (don’t worry, you read that number right). I even went so far as to postpone earning my college degree because I want this to succeed more than anything. This series means everything to me, and I want to share it with the world. I’m hoping you’ll trust me enough and give me a chance to share it with you, too. So, please, check out the Kickstarter page and back SEASONS today. We have some sweet and affordable deals for everyone (just buying the hardcover book is only $20), and I’ve laid out all the info regarding how much everything costs and when you can expect SEASONS Volume 1: Spring at your door. Backing it would mean so much. 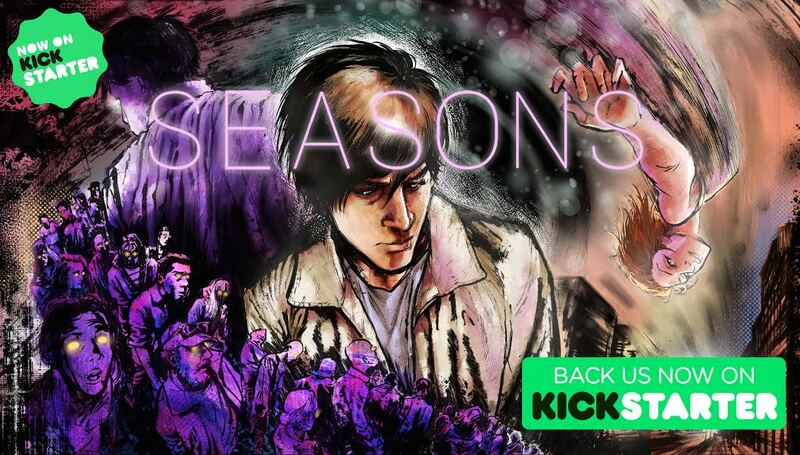 And don’t forget, you can read SEASONS entirely for FREE @ http://seasonsthecomicbook.com if you’re not sure you want to pledge towards the Kickstarter. This way you know exactly what you’re getting from Anthony and I. Thanks, guys. I hope to get SEASONS in your hands very soon! The month of May was one of the most dynamic for my comic book titles. The biggest thing to report is welcoming back Steve Rogers as Captain America in the extra-sized (and now highly controversial) Captain America: Steve Rogers #1 ($4.99). Captain America has been favorite superhero character for years, and, while I think it’s unnecessarily convenient for there now to be two Captain Americas in the Marvel Universe, it’s so great to have my captain back. That is unless he is truly an agent of the evil HYDRA organization, an unexpected reveal at the end of the issue that got both fans and critics in a tizzy. There’s a lot that could be said about this, and I certainly am against this decision by writer Nick Spencer and Marvel, but I’m 100% confident this is something being blown out of proportion. It’s a common ploy in comics to get people talking, as well as get as much publicity as possible from the media, so rest assured, Steve Rogers will not be a part of Hydra for long (if he even is). Staying within the vicinity of Cap’s world, the Thunderbolts return under the leadership of the Winter Soldier in Thunderbolts #1. This was another one of those “impulsive buys” I’ve been finding myself doing recently, but I’m happy to say the issue wasn’t a waste of cash in the end. In fact, the ‘90s style of art by Jon Malin was entirely refreshing. May sought to give me double-doses of three of my books. Two issues of Uncanny Inhumans, Doctor Who: The Eleventh Doctor, and The Flashreleased. Uncanny Inhumans #8 and #9 explored the origins of Queen Medusa and Human Torch’s romance, the 11th Doctor’s hunt for who framed him for genocidal murder continues in #8 and #9 in his book, and The Flash ended its New 52 run, along with Aquaman, with issues #51 and #52. The “Rebel Jail” storyline concluded inStar Wars #19, while the exceptionally well written fifth and final issue of Star Wars: Obi-Wan & Anakin also hit shelves. But out of these and other nominees, which comics received the Comic Book Awards for May? (Disclosure: I wasn’t able to pick up Moon Knight #2 because all of my local comic shops sold out curiously enough, but it is on order. Sadly, it is disqualified from being a potential nominee for this month). One thing I enjoy almost as much as watching the wonderful Doctor Who TV series is reading the spin-off comic books, which can include some marvelous artwork and images. Mark Wheatley’s cover for Doctor Who: The 11th Doctor Year Two #9 is one such example. The cover artists Titan Comics hires for not only the 11th Doctor comics, but for the other Doctors has been nothing short of exceptional. Every time I walk in to one of the comic book stores in my area and see an eye-catchingDoctor Who picture, it takes some doing to not buy the comic, if only for the sake of owning the cover (I’m a die-hard Whovian, what can I say?). What makes Wheatley’s cover so impressive is its spot-on presentation of the 11th Doctor, as played by Matt Smith. It’s impossible for the reader to mistake the face for someone else, and the way in which Wheatley captures Smith’s aura – his dramatic facial expression and fiddle of the 11th’s iconic bow-tie – gives the cover an overwhelming pop and respect. The clarity and realism of it takes me aback entirely, as if it came straight from a scene in the show itself. The consistency of talented art is there enough in Steve Rogers: Captain America #1 to hold it high above the other books for May. Disregarding the escalating controversial nature of Steve Rogers: Captain America #1, the great artwork, done solely by artist Jesus Saiz, within the single comic book issue leaves little room for debate or disappointment. Steve Rogers: Captain America #1 feels and looks like a natural superhero book because of Saiz; all of the characters look tough, but distinct; the settings feel like they are from a comic book, but still convincing. Jesus does a very fine job at following Spencer’s script to the last line, his storytelling skills clearly apparent. Captain America comics are known for their action sequences, which Jesus knocks out of the park (pages 4 and 13, especially). Captain America’s new outfit in the midst of battle really steals the show. I did find some of his panels to look too stiff or too generic, however. The best thing about Jesus Saiz is his all-around talent. Contributing the pencils, inks, and colors for this issue, and most likely for the length of his tenure on the book, Saiz gives the reader his all. Being a huge, passionate fan of the Star Wars prequels, Star Wars: Obi-Wan & Anakin has been my favorite comic series of the license Marvel has put out yet. Since every single past Expanded Universe story about Anakin’s time at the Jedi Temple and training under Obi-Wan has now been debunked under Disney’s shadow, it was a tremendous surprise to get a new canonical tale of these brothers in the Force so soon. Considering how much Star Wars fans want to distance themselves from the prequels (an unfortunate fact), a story from this era is just as shocking to me as well. The plot of Anakin & Obi-Wan finds the master and his apprentice stranded in the middle of a planetary civil war between the tribes of The Closed and The Open on the planet Carnelion IV after learning of a distress call from the planet’s surface. To add to the tension, this is supposed to be Anakin Skywalker’s last mission as a Jedi disciple; he has decided to leave the Jedi Order for a time, which troubles Obi-Wan. The series has done a fair job at juggling these two threads of narrative, and the fifth and final issue features one heck of a payoff. The last few pages of this issue made the entire series worth it for me. I was really touched by how writer Charles Soule handled the relationship between Obi-Wan and Anakin throughout these five issues, and although the limited series felt slow, a bit underdeveloped, and didn’t deliver on the lightsaber-wielding action I had hoped for, the scope of it and underlying theme on what it means to be a Jedi made for a very agreeable read. More comic books on the young adventures of this master and apprentice, as well as from the prequel era, would be awesome to see more of in the future. There’s not a particular special quality of International Iron Man #3. Every significant facet of this issue from Brian Michael Bendis and Alex Maleev is simply solid, and these combine to produce a memorable, engaging comic book. Let’s start off by inspecting Maleev’s cover art. First off, the image speaks of legacy, the past meeting the present. Tony stares intently at the helmet of the most current iteration of his armor as his first, technologically handicapped suit looms in the backdrop. The way the tender blue of Tony contrasts against the bright orange and deep red surroundings of the page precisely captures the weighty presence of the artwork’s message. I’ve been an admirer of Maleev’s talent for a while now, and this cover only furthers my admiration for him and his skill. Moving on to Maleev’s interiors, I will say his work is not as impressive. This is most likely due to Paul Mounts providing his colors to Maleev’s pencils and inks. The two gel well together visually, but there are times I wish Maleev was doing his own colors for the book. Nonetheless, the crispness of Maleev’s work is brilliant in International Iron Man #3. I primarily love how he draws a young Tony Stark and portrays the sweet, reckless romance scenes between him and Cassandra. The point of the International Iron Man title is to give readers a more in-depth look at Tony Stark’s life outside of the mainstream Marvel universe. In the three issues so far, the book has been revealing to us a past romantic event with a Cassandra Gillespie from Tony’s earlier years when he was a college student. In the present day, Tony’s search for his real parents has led him back to Cassandra, now an international arms dealer. Gradually with each issue, we’re getting more backstory on Tony’s relationship to this character, and here we find out her attraction to Stark wasn’t all that sincere in the beginning. Bendis’ writing for the series is in its best form in some time, with smart and fun dialogue cohesively and consistently holding everything together in this third issue. I look forward to finding out Cassandra’s connection to Tony’s real parents in the coming months, and seeing how his past relationship with her eventually falls a part. Thank you all for checking out my awards for May and be sure to check back sometime next month for June’s Comic Book Awards. Until then, hopefully you and I will continue to be reading comics! I picked up 13 comics this past April including my regulars, the second issue for International Iron Man, Sam Wilson: Captain America #8, Avengers Standoff: Assault on Pleasant Hill Omega #1 – the conclusion to the event – and Moon Knight #1 by Jeff Lemire and Greg Smallwood, an impulsive buy originating with sheer interest on my part. I barely know anything about the character, and this would truthfully be my first Moon Knight comic book. The first issue of the new Moon Knight series was unexpectedly the best comic book of the month on all fronts, with the runner-ups Doctor Strange #7, The Astonishing Ant-Man #7, and International Iron Man #2 trailing close behind in differing categories. I’m not sure if I’ll continue with this new title (money is money, after all), but it’s off to a very good start and I would recommend giving it a try. The extra-sized Flash #50 released this month, but I found it, as well as Nick Spencer’s final Standoff issue, to be disappointing. I’m liking Dan Abnett’s Aquaman so far, and the last issue of the latest Uncanny Inhumans story arc ended on a more satisfying note than how it began. But out of these and the other four remaining nominees, why did Moon Knight #1 sweep the Comic Book Awards for April? The most obvious visual trait to Greg Smallwood’s cover for Moon Knight #1 is how much the color white overwhelms the image. Some may say this lack of color variety or artistic detail detracts from hypothetically “more interesting” cover art, but, on the contrary, these traits are exactly what furnish a stunning piece of artwork. Marc Spector gazes intensely at the reader, garbed with a straightjacket in a place that faintly resembles a solitary confinement room found in metal hospitals. Spector’s eyes and shadow, plus the brown straps of the jacket, help balance the visual impact of the cover. There is a serene creepiness to this image, and the big and bold simplicity of it is a success. 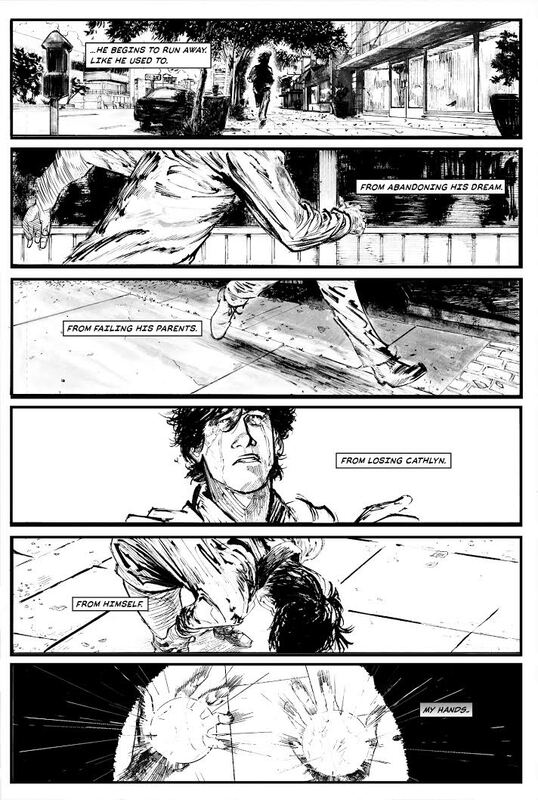 Whether it be the tremendous Bill Sienkiewicz-inspired first four pages, the intelligent artistic storytelling properties of the sophisticated layouts and colors, or a number of other interesting art qualities present within this book, Moon Knight #1 can rest assured as one of the visually deepest comics of the year as of yet. I’m not that familiar with artist Greg Smallwood’s previous work, but if this issue doesn’t put him on the map, then I don’t know what will. 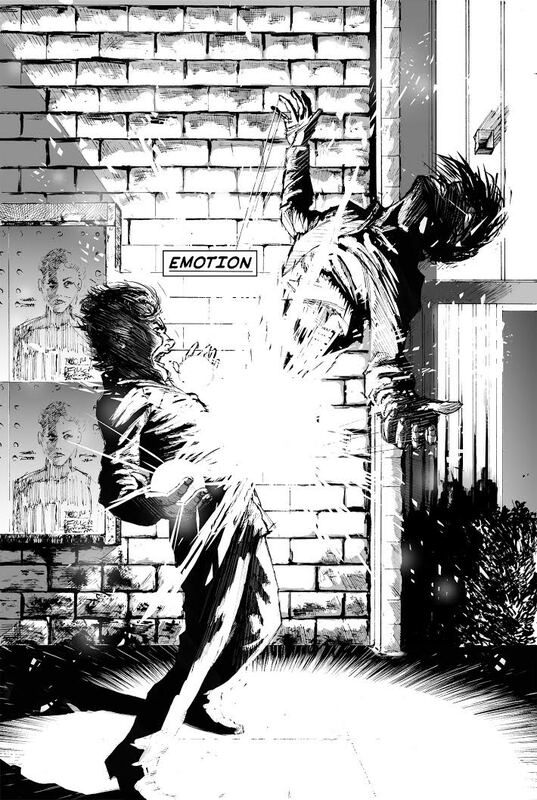 He has a down-to-earth, realistic style in how he draws the characters’ facial expressions and gestures that make them, and the book as a whole, feel grounded and alive. Smallwood also has an intriguing balance between overly simple and overly detailed. One small panel may just offer a bit of art to convey a scene and then the next panel or page is an explosion of crisp pencils and lines. The attention to detail in some of these pages, such as pages 1-4, 22, and 24-26, is very much praiseworthy in so many respects. It’s not everyday that you see a comic book with a 15 panel page (page 26). How colorist Jordie Bellaire accents these pages to consistently carry the reader through the issue’s story is also a great, noteworthy accomplishment. White being the central color to Moon Knight’s persona, its arresting visual presence in the comic, and the decision to emphasize it to separate panels with no outline borders, is without fault. Moon Knight #1 is a stroke of artistic genius in many areas, and how it accomplishes to tell such a captivatingly psychological first chapter in the five-part story with the art is just exquisite. The first issue of any comic book series is always exciting. They have the power to welcome in new readers, and, if the reader likes what he or she sees, produce a monthly subscriber to that series for a time being. I really liked what I read and saw in Jeff Lemire and Greg Smallwood’s Moon Knight #1. The issue begins with our protagonist experiencing a dream, and in this eerie vision/dream Marc Spector (Moon Knight) communes with the Egyptian moon god Khonshu, the source of his powers. Khonshu asks, “Mark? Mark, can you hear me? Mark, is that you?” to which he replies, “I-I’m not sure.” These first few lines of the first page set ablaze the theme of this entire issue as Marc Spector searches out his true identity. Waking up in a mental asylum, Mark is told the Moon Knight figure is a figment of his imagination and a side-effect of his mental disorder. 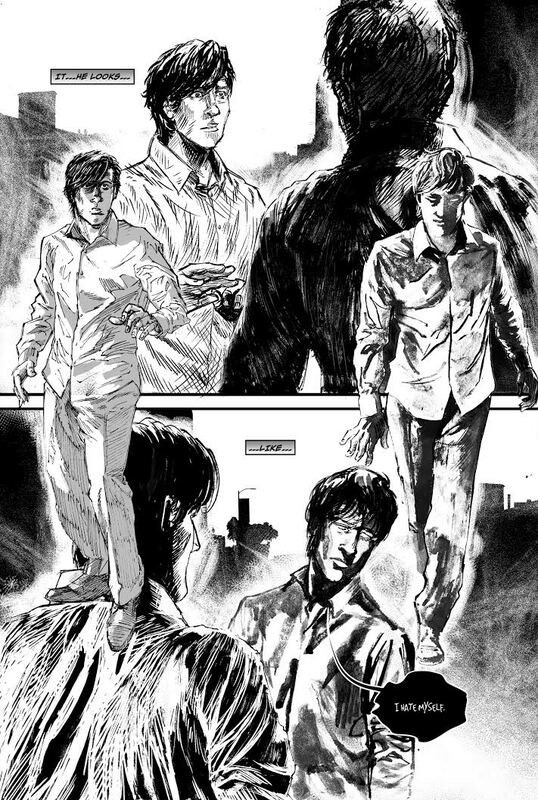 He eventually tries to escape, not willing to believe his entire life to be a lie, and what he stumbles upon as he reaches the building’s rooftop shocks him. An Egyptian invasion force has took over New York; however, it appears to be unseen to the naked eye. The mysterious story of Moon Knight #1 keeps you guessing and you feel for Marc Spector’s confused predicament. At the end of the issue, I had to ask myself, “What is really going on here?” and I love that invested feeling a great comic book can give a reader. The more I tell you how much I enjoyed Moon Knight #1, the more I want to continue reading what is in store for this character (sorry, wallet). By winning Cover of the Month, Art of the Month, and Story of the Month, this issue automatically places itself as Issue of the Month for April 2016. There’s not much else to say except that I strongly hope this series can continue on with this much talented care and quality. It’s commonplace for comic book series’ to start off a critical hit and then descend into the herd of subpar comics you see on the stands, but I think as long as Lemire and Smallwood continue to keep on keeping on, it won’t fall into this. With all that said, go out and pick up Moon Knight #1! Like, right now! Thank you all for checking out my awards for April and be sure to check back sometime next month for May’s Comic Book Awards. Until then, hopefully you and I will continue to be reading comics! Honestly, March was a nice month in the comic book department. Avengers Standoff: Assault on Pleasant Hill Alpha #1, the start of Marvel’s Spring comic book crossover event, hit shelves along with Sam Wilson: Captain America #7, a continuing chapter of the event and a 65 page, 75th anniversary special featuring additional stories from Joss Whedon and John Cassaday, Tim Sale, and Greg Rucka with Mike Perkins. Both Avengers Standoff chapters were written by Nick Spencer, with Sam Wilson: Captain America #7’s storyline being the better out of the two, in my opinion. In this issue, we at last see Steve Rogers given back his super soldier abilities and youth. No more old, grouchy Steve; we now have our true Captain America back. The sister title debut to Invincible Iron Man, International Iron Man #1 written by Brian Michael Bendis and drawn by Alex Maleev, released this month. This series aims to explore Tony Stark’s past, and the mystery behind his real parents. This idea that Tony is not the actual child of his parents was addressed in Kieron Gillen’s Iron Man run a few years back (The Secret Origin of Tony Stark), which I never liked as a plot device to somehow make Tony Stark a more mysterious figure. It was sorely underdeveloped, even awkwardly strange, in Gillen’s run, but here’s hoping Bendis can turn it into a great facet to Tony’s character and origins. Aquaman’s 50th issue was double-sized, for some reason The Flash #50 didn’t release, the Eighth Doctor’s first limited-series comic book adventure concluded with issue five (thankfully, because I did not like this book), the third issue of Star Wars: Obi-Wan & Anakin hit shelves, and many others made it into my monthly batch. Out of these and other nominees, which comics received the Comic Book Awards for March? Marvel has kept the great Alex Ross busy in recent months. Ross has been providing the cover art for All-New, All-Different Avengers on a consistent basis and a few variant covers for other comic book series’. To celebrate the 75th Anniversary history of Captain America, there’s only a small handful of artists – Alex Ross included in this group – that deserve such an honor. The cover Captain America: Sam Wilson #7 portrays the current Captain America, Sam Wilson (formerly the Falcon), diving in to administer a right punch to the original Cap, Steve Rogers, as S.H.I.E.L.D. agents fire away. The cover also spotlights the Winter Soldier in the bottom left corner. It’s not just the excellence of Ross’ work for this cover, but the throwback format it adopts that makes it stand out. The classic title font, propaganda-like image (Sam Wilson never confronts Steve Rogers in the issue), and lettering on the page present a fitting anniversary and nostalgic touch to commemorate one of the most iconic comic book characters of all-time. Double-sized, anniversary issues such as this can be a real treat to the reader. It’s true that this type of comic book costs more, but the short stories by guest writers and artists usually (not all the time, unfortunately) make spending the extra cash worthwhile. Captain America: Sam Wilson #7 is divided into five separate sections: the first eight pages tell of Sam Wilson and Winter Soldier’s meet up in Pleasant Hill written by Nick Spencer with art by Angel Unzueta & Matt Yackey, the following chunk of the issue observes a gruesome fight between Crossbones and Steve Rogers, who is renewed back to his super-soldier, younger self also written by Spencer with art by Daniel Acuna, and the last three sections feature stories by Joss Whedon and John Cassaday, Tim Sale, and Greg Rucka with Mike Perkins. The variety and quality of artwork found in Captain America: Sam Wilson #7 is really the underlying allure of the book, and the one double-page spread by Daniel Acuna which traces the life and memories of Steve Rogers on the verge of his supposed last breath is the selling point from an artistic perspective. There is a bulk of talent in this 60 or so pages; no doubt about it. I have to say, Jason Aaron’s Doctor Strange is doing well for itself. The book is heading in the right direction with its dark and interesting tone, and the writing for the good Doctor is almost entirely spot-on. Doctor Strange #6 boasts the start of a new storyline – and it is to a certain extent – however, I find that to be misleading since the issue is completely a continuation of the events in previous five issues. Despite this minor irritation on behalf of the plot, this issue is terrifically wicked (pardon the pun). 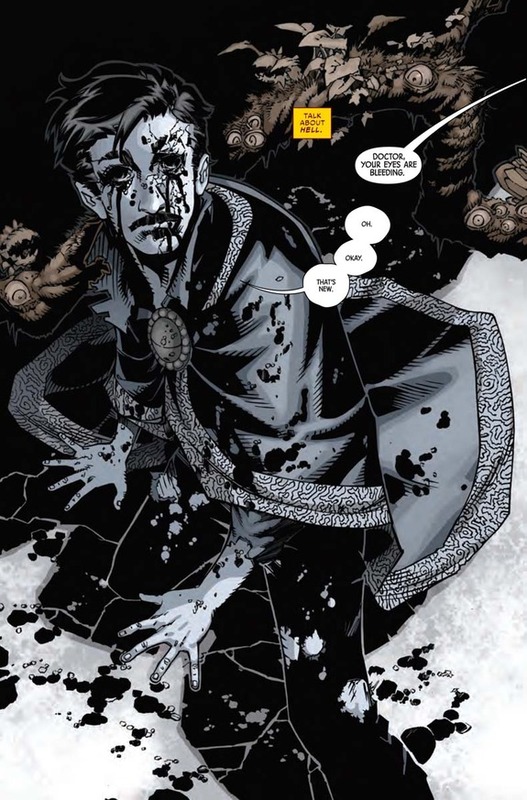 The Empiriku are sucking the last vestiges of magic in the world (as well as other alternate worlds and universes), and Doctor Strange makes a stand against the leader of the invading perpetrators, known as the Imperator. This battle between magic and science does not end in Strange’s favor as he is left on the ground, beaten and damned by his foe, and the last remaining ounces of magic are drawn from the earth. 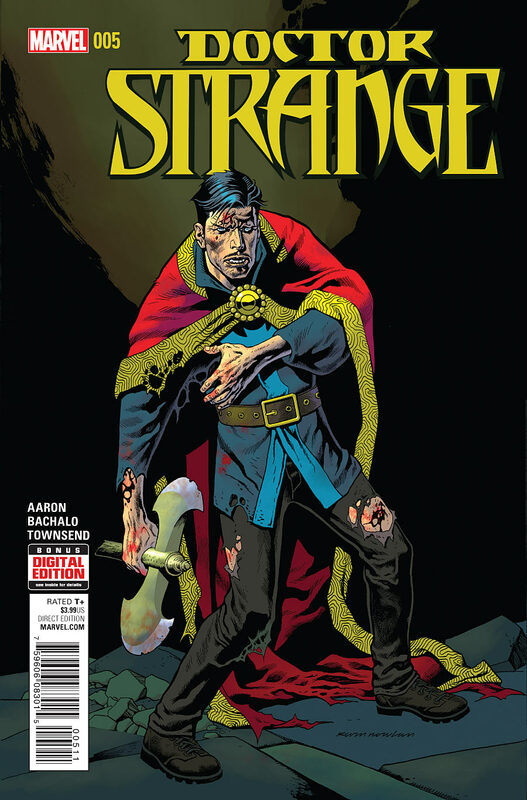 There is theme of desperation in Doctor Strange #6 that certainly keeps the reader on edge for its entirety. More doesn’t necessarily always mean better when it comes to creative content, but that isn’t the case concerning the amount of quality work present in Captain America: Sam Wilson #7. Marvel did the right thing in returning Steve Rogers back to his super-soldier self and how Nick Spencer brilliantly does so in this story is commendable. The three extra storylines to close out the issue are also great, albeit brief, reads as well. “Presentation” by Joss Whedon and John Cassaday is a nine page potent tale of Captain America during the war in the 1940s, Tim Sale’s “Catch Me If You Can” is a simple scenario of Cap infiltrating a Hydra base in the present day to retrieve a sentimental item, and Greg Rucka’s “Pas De Deux” reminded me of the good ol’ Ed Brubaker and Steve Epting years with its espionage, James Bond-style of storytelling (Mike Perkins’ art conveys this, especially). Overall, this is a excellent read for both present and past Captain America comic book fans with its respect for the history of the character and its strides forwards regarding the character’s future. Comic Book Awards for February. In February we got our first taste of Marvel’s upcoming spring event, Avengers: Standoff by Nick Spencer. Written by Spencer with art by Mark Bagley, Avengers Standoff: Welcome to Pleasant Hill #1 comes as an enjoyable prologue to the event and its many series’ tie-ins. The thrilling setup differentiates this Marvel event from ones in recent years so here’s hoping the rest capitalizes on what it has built up. My regular titles maintained their pace for the most part this month. The Astonishing Ant-Man continues to be a highlight and I was treated to two issues of The Flash in response to the book’s tardy release last month. Aquaman #49 and Uncanny Inhumans #5 flopped big time in February – the scripts for both issues were under-par – but the good news is that Doctor Strange #5 was a stellar dip into the weirdness and spectacular flare of the Sorcerer Supreme. Star Wars #16, Star Wars: Obi Wan & Anakin #2, Doctor Who: The Eighth Doctor #4, and Invincible Iron Man #6 also made their way into my comic book pile this month. But out of these nominees, which came out to boast an Comic Book of the Month Award? Artist Brandon Peterson holds to an distinct glossy, digital style. If you follow his work you’d begin to notice how vividly it pops from the page. You could say he’s an expert at making his work on the 2-D page look as though it was 3-D, even. Peterson provides the pencils and inks for the interiors as well as the entirety of the cover art to Uncanny Inhumans #5. 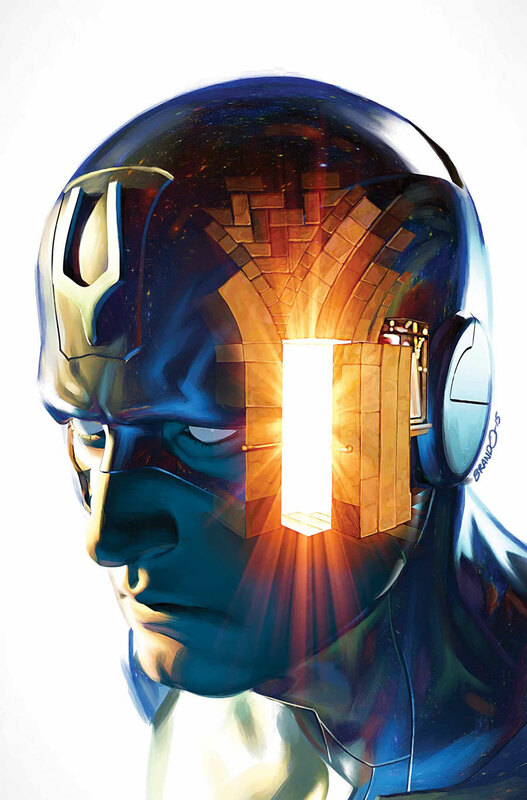 The cover features a stunning face image of Black Bolt and within it is an image of the entrance to The Quiet Room, which is the focus point of the story in this issue. The white backdrop fits as a nice contrast to cap this cover artwork off. Chris Bachalo has been contributing some of his best work I’ve seen in these last five issues of the ongoing Doctor Strange title. While I still dislike how his panel flow is somewhat disjointed, it also makes his artwork interesting to study. Bachalo is also one of those few professionals to do both pencils and colors, sometimes inking on occasion. His color work is what really shows in Doctor Strange #5, giving a nice layer of haunting atmosphere to many of the pages. This issue is big in scope and it’s the dramatic action sequences between Strange and his encroaching foes that make a lasting impact. The designs for this new tier of villainy, The Empiriku, add an extensive creep factor to the mix, too. By and large, this issue is the most visually complex comic book of February. In recent years there’s been this theme of “paying the price” or a “cost” to Doctor Strange’s use of questionable magic at the heart of his character arc. You saw this brought forth especially during Strange’s exploits in the New Avengers series. Jason Aaron’s handle on the book thus far has emphasized that point a great deal, and in Doctor Strange #5 he explores it further. Wong, Doctor Strange’s loyal assistant and friend, has secretly orchestrated a system of magic conduits in the form of using real people to channel magic’s overwhelming “cost” (so, to explain, what the good Doctor should be experiencing after casting one black magic spell, the consequences of his actions effect the conduits instead). This is a side plot in light of the issue’s whole, but an important one that I think will have reverberations in future issues. The bulk of Doctor Strange #5 deals with The Empiriku making their way towards Earth to obliterate all the magic it holds, including its protectors and users. A global battle of magic ensues and the good guys come out on top…or do they really? What comes next beckons. 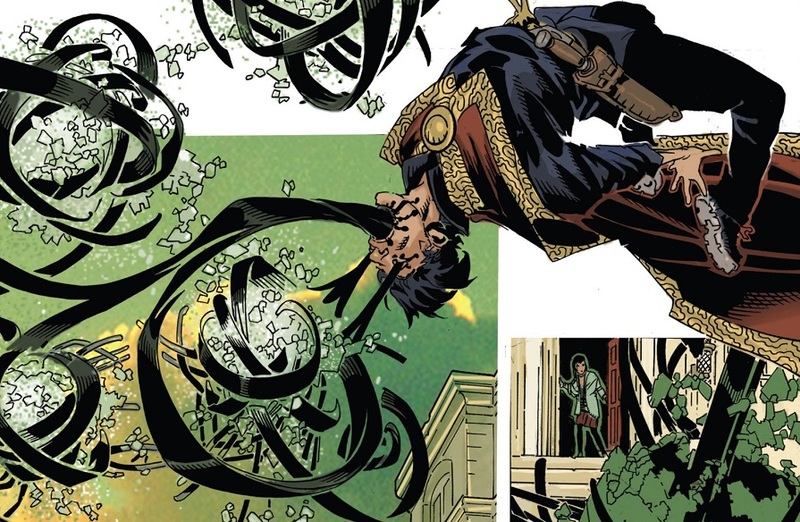 The more I take time with Jason Aaron and Chris Bachalo’s Doctor Strange #5, the more I can’t help but admire it. It was a tough pick between Avengers: Welcome To Pleasant Hill #1 or this for Issue of the Month, but this comic book issue emerged in sweet success after all. This is truly a fine comic book issue, no one could hope to deny that. It capitalizes on what’s come before – adding in a new, tasteful turn of desperation for the series – and Bachalo lets loose to interpret the script with provocative results in an outstanding fashion (pages 2, 16, 18, and 20 are just terrific). With a tinge of humor, a weighty dose of Doctor Strange spell casting action, and a notable tone of comic book class, Doctor Strange #5 is a recipe of charming resonance. Once again, I appreciate all who’ve checked out February’s edition of my annual Comic Book of the Month Awards. Check back sometime next month for the Comic Book of the Month Awards for March! Until then, hopefully you and I will continue to be reading and enjoying comics! It is a tad ironic that the new years’ general optimism is paired with the farewell to likely my favorite comic book run in my short but substantial history of reading comics. This refers to Jonathan Hickman’s Avengers/New Avengers/Secret Wars saga which began three years ago and is now concluded with Secret Wars #9. It’s never a good time when a beloved series ends, but this one in particular holds an unmeasurable amount of meaning to me on creative, literary, artistic, inspiring and even sympathetic levels, to say the least. I’ve been caught up in reading this storyline since its debut, as probably many others have, too, so I hope that puts into perspective just how poignantly bittersweet for me this is. Because it won every award, this edition of my Comic Book of the Month Awards for January 2016 will be a thorough overview of every layer of Secret Wars #9. But, before we get into how masterful a comic book it was, there are other books worthy of attention. If Secret Wars #9 hadn’t swept this month’s awards, Uncanny Inhumans #4, The Astonishing Ant-Man #4, Invincible Iron Man #5, and Star Wars #15 would’ve been the top nominee picks, hands down. The fourth issue of Uncanny Inhumans, wrapping up the book’s opening arc, is squarely a fantastic issue. The pacing and panel-work reminds me of that classic superhero comic book style in many ways. 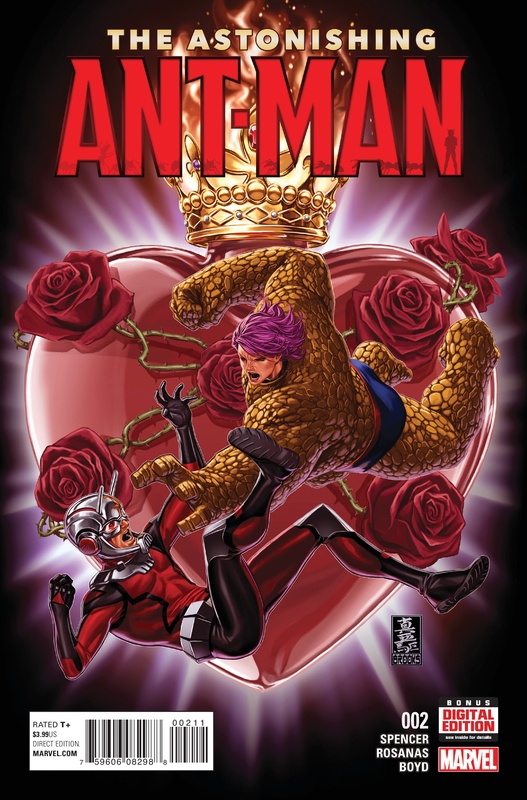 The Beetle flew in to distract Scott Lang once more while he does his best (ever the trier) to protect his daughter Cassie from a wannabe super-villain in The Astonishing Ant-Man #4 and Madame Masque is beaten in a bombastic clash by an unlikely team-up of iron Man and Doctor Doom (now assumed “redeemed”). Star Wars #15 returns to exploring Obi-Wan Kenobi’s adventures on Tatooine during his exile and following up on Star Wars #7’s events. Mike Mayhew was absolutely an ideal choice for this issue and I hope as these issues centering on Obi-Wan release in the future that higher-tiered artists are brought in. The first issue of Star Wars: Anakin & Obi-Wan, Star Wars #14, Doctor Who: The Eleventh Doctor Year Two #4 and #5, Doctor Who: The Eighth Doctor #3, Aquaman #48, and Doctor Strange #4 also released. And, last but not least, Scarlet Witch #2 made its way into my pile only because Marco Rudy was the featured guest-artist of the issue (buy it!). If you don’t know by now, Secret Wars #9 marks the end of every Marvel Comics Universe of the past 75+ years, with a new one emerging in its wake which combines remnants of future or alternate timelines and universes into one universe, including the original. With that said, we’re allowed one last glimpse of what has come before on Alex Ross’ sentimental cover for the issue. Surrounding the climactic clash of Mr. Fantastic and Doctor Doom are memorial-themed shards of legendary events and moments of the MU’s unforgettable past. Towards the middle-left records when Jean Grey first returned as The Phoenix, with a view of Asgard, the patriotic Howling Commandos, and Elektra’s gruesome death by the hands of Bullseye in close proximity. The top right corner is the classic image from Iron Man’s “Demon In The Bottle” storyline from the 80’s as a recovering Tony Stark looks at himself soberingly in a mirror, and we also can make out the Gamma-bomb detonation that turned Bruce Banner into the Hulk, the birth of Franklin Richards, a floating Attilan, Steve Rogers moments right after he’s taken the super-soldier serum, and others on this nostalgic, marvelous cover for Secret Wars #9. It’s relatively hard to miss, but you’ll notice the pure white outline of who appears to be Molecule Man dividing these pieces of Marvel’s history; Mr. Fantastic and Doom meeting at his chest and shoulders. This cleverly adds additional structure to it. 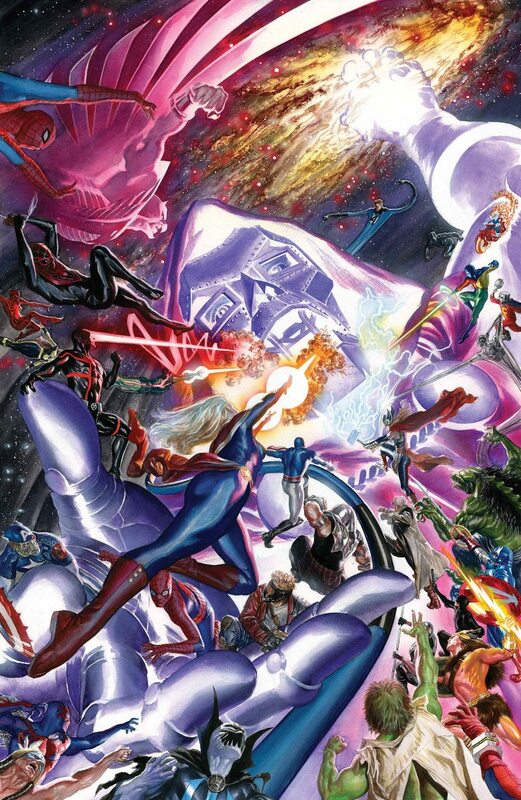 I’m very proud of Alex Ross for contributing his talent to Jonathan Hickman’s Secret Wars throughout all nine issues. He’s single-handedly brought so much value and weight with him being a part of this series and there is not one artist better suited, with all his ability and endearing classical style, to open up the final chapter of the Marvel Universe as we have always known it. From reading interviews when promoting Secret Wars, writer Jonathan Hickman is very vocal on his love for Esad Ribic as an artist (having had a working history with him). They’re a formidable team when it comes down to the comic book page and the 34-page, extra-sized ninth issue for Secret Wars stretches Ribic’s unflinching commitment to the book. Now, there is a lot at stake visually when wrapping up a major comics event on this scale and you can tell Ribic’s interpretation of Hickman’s script is dead on from the outset. His pages consist of both traditional and, at times, unconventional panel work for the series. Page 16 is a classic example of this. The heart of the issue concerns the timeless struggle of Mr. Fantastic and Doctor Doom’s personalities and page 16 combines their faces into one complex, all-too impressive collage. Ribic does a crack job on the rest of the issue as well. While he has never had a hand for detailed pencils and inks, allowing brilliant colorist Ive Svorcina fill in what is lacking, his angles and proportions are gorgeous. The panels with no dialogue/narration are just as powerfully engaging as the one with dialogue/narration; an incredible feat for an artist to achieve. Looking through Secret Wars #9, I couldn’t tell you what my favorite page is because there are so many. The optimism of the issue shines forth from Ribic and Svorcina’s work with beautiful results. Personally, with all the other art teams out there, I wouldn’t have chosen this particular team to close out Hickman’s epic run, but seeing how it has turned out to be this outstanding, I don’t mind one bit. Secret Wars #9 is not your traditional final issue of a major comics event. You would imagine the conclusion of any major comics events to end in fireworks, and, while Secret Wars #9 does, it is more on an intimate level in the form of Mr. Fantastic and Doctor Doom’s impending encounter for the ages. The raging war on Battleworld takes a backseat to let these men, who have so much in common but, strangely, so little, too, go at each other in a bare-bones battle that I’ve been wanting to see since Hickman was writing Fantastic Four/FF from 2009-12. The issue begins as Black Panther, wielding an Infinity Gauntlet, and Namor confront God Doom in the midst of all-out devastation. But this soon goes sour for the men and, following a mythological-like quarrel between Black Panther and Doom, he heads off to confront Reed Richards. Meanwhile, Reed, along with The Maker (Mr. Fantastic’s Ultimate Universe doppleganger), enter Molecule Man’s isolated location and have a deceitfully planned falling out on The Maker’s part. Doom and Reed then meet at last and what transpires henceforth is a dramatically-charged fight of ideologies with fists. Hickman’s dialogue for these two characters is spot-on, brilliantly written and paced. It is the ultimate final battle in many respects. This isn’t where the issue stops, however. Without giving away how, the Marvel Universe rebirths for a new tomorrow and we see where some of our heroes (and a certain villain) end up. Throughout the span of Avengers and New Avengers has been this theme of the death of everything, touching on serious and depressing issues of mortality. Secret Wars #9 resolves these themes into probably one of Jonathan Hickman’s positive comic book issues to date in a truly, dearly phenomenal way. By critically establishing the exquisitely stirring cover from the great Alex Ross, the powerful artwork from Esad Ribic and Ive Svorcina, and genius storytelling from a creative crafter of the past decade, Jonathan Hickman, there isn’t much else left to point out from Secret Wars #9’s abounding richness. It is a multiple-award winning comic book and why has clearly been presented. The end to my favorite comic book storyline of all-time has concluded and what is next for Mr. Hickman in Marvel has yet to be unveiled. What we can now do is appreciate this long journey for what it is: a timeless treasure of superhero and comic book artwork and literature. Before I wrap up, I would like to express my thanks and gratitude for writer Jonathan Hickman. If you’ve been following my blog the last year or so, you’ve likely noticed my diehard affection for his writing and adventures. This is is because I honestly consider him to be the best comic book writer of the past decade and possibly of all-time (for me, at least). From Nightly News, Secret Warriors, Fantastic Four/FF, Red Mass From Mars, East of West, Manhattans Projects, S.H.I.E.L.D., etc., he’s a constant overachiever in the business and has absolutely transformed the way I look at comics as a serious job and art form. HisAvengers/New Avengers/Secret Wars run of the past three years has been one of the most exciting, interesting, and enjoyable experiences I’ve ever had in reading comics. And now thank you all for checking out my awards for January 2016 and be sure to check back sometime next month for February’s edition of my Comic Book Awards (what will I do without a Hickman-written comic in my pile?!) Until then, hopefully you and I will continue to be reading comics! December’s dozen or so comics said goodbye to 2015 on good terms for me. The second-to-last issue of Secret Wars released, a highlight of the month, with all-out war progressing on Castle Doom. Even if the conclusion will be an extra-sized issue, I’m remaining on the edge of my skeptical seat to see just how Mr. Hickman plans to finally finish what his very first Avengers issue began a few years ago and additionally birth this “new” Marvel universe. 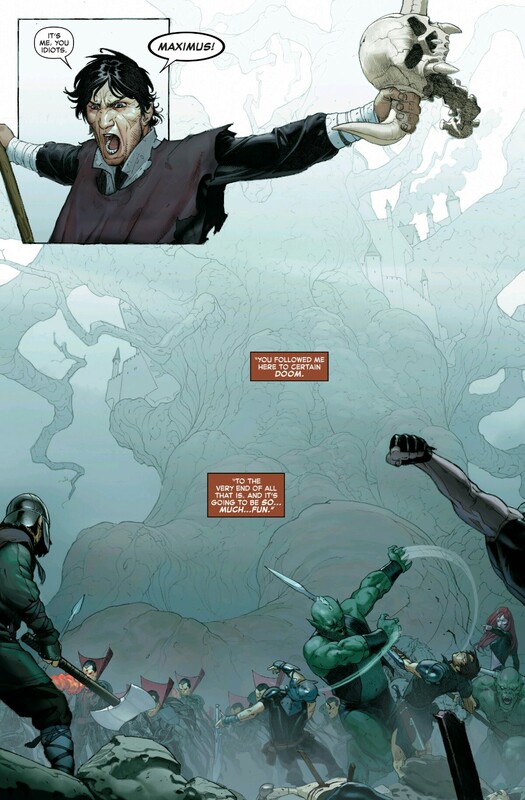 I had a great time with the humorous, mystery-narrative driven Doctor Strange #3 by Jason Aaron and Chris Bachalo and the third issue of The Astonishing Ant-Man picked up where #2 left off, Sam Wilson as Captain America asking Ant-Man for some assistance amidst Lang’s unfortunate but always entertaining troubles. Part III of the Vader Down crossover came in Star Wars #13 with excellent art from the popular Mike Deodato, the 9th Doctor’s miniseries concluded with #5 (soon to return from Titan as an ongoing series) as he and his two companions – Jack Harkness and Rose – extinguished the fight between the Unon and the Lect, and Kang’s toll on Black Bolt’s son, Ahura, is fully realized by the surviving Inhumans (including Black Bolt himself) in the intense Uncanny Inhumans #3. The fourth issue of Invincible Iron Man proposes Mary Jane’s introduction into the world of Tony Stark, but she’s only teased by the end of the comic. Doctor Who: New Adventures With The Eight Doctor continues to be somewhat of an underwhelming book with its second issue, however, Year Two of the Eleventh Doctor is living up to be a wonderfully written Doctor Who comic book in almost all respects. And so, out of these and other nominees, which comics received the Comic Book Awards for December? The cover for Uncanny Inhumans #3 – pencils by McNiven, inks by Leisten, and colors by Ponsor – is gripping. Former Inhuman king Black Bolt is roaring in anguish as spreading flames of fire terrorize his image and, despite the subject matter, it’s conveyed splendidly by the artists. I appreciate how close up and direct this cover is, and exactly because of that, it sells the thought of the torturous pain on Black Bolt’s angled face (this and his eyes slits of pure black to add dramatic effect). The prominent orange/red of the cover for Uncanny Inhumans #3 is vibrantly contrasted against the two bursts of bright white-blue coming from his antenna and mouth, also. Packing a real, impactful sonic punch, this is definitely the Cover of the Month for December 2015. It is my notion that those who critique comic book artists would likely agree with me in that penciller and inker Simon Fraser’s work is just shy of above average. From my limited experience of his artistic exposure, he is one of those artists that when you examine a page or panel he’s done, it’s simply fabulous, but then you flip the page or look at the following panel and then you all of a sudden wonder why a character looks like he or she was drawn in two seconds. Fraser has his moments, I should say, and while his lack of detail or accurate proportions hurts his style to an extent, it is also what enhances his style to better appreciate its own unique facets. He has been the strongest artistic contributor to the Doctor Who: The 11th Doctor comic book (rotating with Warren Pleece at times), and over the course of the series Fraser has exponentially grown on me. Providing Doctor Who: The 11th Doctor with arguably its best issues visually, along with colorist Gary Caldwell, Year Two #3 will be added to a top spot on the list. If you noticed, the issue alternates between one page splash pages and eight-panel pages throughout. The method works spectacularly for emphasizing key story points and this subtly opens up the structure of the comic in its entirety, making for such an enjoyable read. I’m not lying when I state these images that take advantage of the entire page (a.k.a. splash pages in comic book rhetoric) are some of the series’ most impressive to date and page sixteen may even give goosebumps to Whovians. Caldwell’s colorist abilities add to Year Two #3’s lasting result in essential ways with how he cleverly differentiates scenes and characters as well, leaving the panels with Alice and Squire with grey and purple values and the panels with The Doctor with a variety. Doctor Who: The 11th Doctor Year Two #3 is a comic book issue that you can tell was approached with shining confidence on an artistic, creative level. Jonathan Hickman’s Secret Wars was initially supposed to be an eight issue limited series. I do not know the behind-the-scenes reasons for why they extended it to a ninth issue, but because of what, and how much, is going in Secret Wars #8, I can positively understand the extension. War has reached Castle Doom and with it a sky scraper-sized Thing, opposing kingdoms of Battleworld, and, by the end of the issue, the ghoulish undead lead by Namor and Black Panther, who courageously wields the treasured Infinity Gauntlet. Hickman isn’t known for action-oriented issues, but Secret Wars #8 breaks that mold. Galactus, controlled by Franklin Richards, engages The Thing in a monumental explosive clash and the Thanos confronts God Doom that reaches an ugly, terrific ending for the tyrant. Without giving anymore away from this historic run, the majority of the issue is an abundance of epic combat that is balanced by parts of tension-filled dialogue and you’ll be dying to pick up Secret Wars #9 (which is out now!) in the aftermath. With just the four issues released so far (counting the zero issue), Uncanny Inhumans has already taken pretty bold steps. If you’re unaware of the current happenings in the storyline, Black Bolt gave his son to the time-traveling villain Kang in the event of the assumed “end of everything” heralded by the incursions from other universes (read Hickman’s legendary New Avengers for clarification). Since existence did not cease to exist, however, Black Bolt wants his son back (and tries to retrieve him in Uncanny Inhumans #1) but Kang, as you could imagine, will not have that whatsoever. To punish Black Bolt for his offense, Kang has set out to obliterate the Inhumans from the timeline and has taken Black Bolt’s son, Ahura, as his apprentice, using him to massacre his own ancestors. Uncanny Inhumans #3sees the confrontation between the handful of surviving Inhumans and their allies – Black Bolt, Medusa, Beast, Johnny Storm, Triton, Iso, and Reader (my personal new favorite) – against Ahura, who has aged decades. With that platform, the issue becomes an engaging twenty pages of raving, intense skirmishes. It wouldn’t have turned out as powerful without Steve McNiven’s remarkable interpretation of writer Charles Soule’s script. His crisp pencils give the prominent moments of the storyline a concise sting of beauty. Jay Leisten provides helpful inks but the colors by Sunny Gho and Java Tartaglia at times conflict with McNiven’s sketches.Uncanny Inhumans #3 features an intense chapter in a story that carries with it a tinge of desperation and, in light of the final page, resonating tragedy. The book is heading in a good, dramatic direction that, if kept up, will evolve to become one of the best comic book series’ of 2016, guaranteed. Thank you all for checking out my awards for the final month of 2015 and be sure to check back sometime next month for the first edition of 2016’s Comic Book Awards! I want to give an update and apologize for not posting my Comic Book of the Year Awards for 2015. I had every intention to do so before the year was over, but time was not on my side. They still may be posted in the near future (can’t make any promises), but I hope my monthly awards will be enough for the time being. The start of a new year seems a good time to take a really long, backward look at history. I’m going to do this in one thousand year leaps. So today, here are a few things which happened in the year 1016. Earthquakes hit Jerusalem and partly destroy the Dome of the Rock. In England, Aethelred the Unready dies and is succeeded by his son, Edmund Ironside. Ironside defeats Canute of Denmark in battle in April and, in his turn, is defeated by him in October. Both young kings agree to divide England between them. In November Ironside dies, possibly murdered, possibly by Eadric the Grasper, one of the greatest villains of English history. Interestingly, given the 14th century picture of Ironside to the right, he may have been murdered while sitting on the toilet. Another month equals another wealth of comics on my desk. All-New All-Different Marvel marches on this November and all four of my new pickings are going strong with their second or third issues. 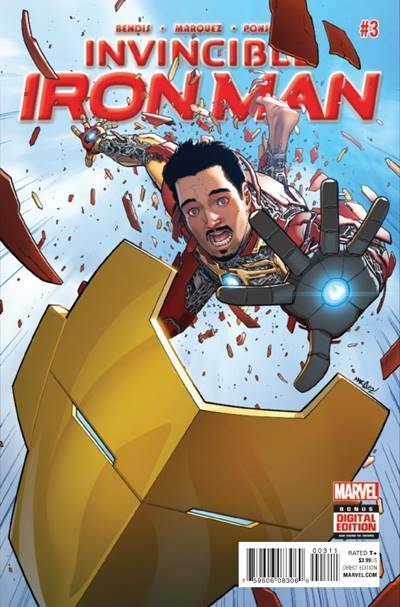 I really enjoyed Tony Stark’s introspective look at himself in Invincible Iron Man #3, in particular. Brian Michael Bendis’ take on the golden avenger hasn’t let me down yet. Although the milestone 600th issue of Uncanny X-Men, also written by Bendis, was absolutely horrible, in my opinion. It’s interesting to me how the same writer can be finely attuned to a character(s) compared to others he leaves his mark on. I received a triple dose of Star Wars this month with the fourth and final issue of Star Wars: Shattered Empire as well as the eleventh and twelfth issues of the main Star Wars title, still written by Jason Aaron with impressive art from Stuart Immomen (whose talent might suit this book better than Cassaday’s work on the first six issues). Both Aquaman and The Flash’s plot developments disappointed me this month, unfortunately. Wonder Woman’s guest appearance couldn’t help the king of the seas and while it’s thrilling to see Zoom/Eobard Thawne’s debut storyline continue, it’s starting to falter and lose its appeal by the devolving script. I did pick up Doctor Who: The Eighth Doctor #1 from Titan Comics and plan to finish the miniseries off when it concludes next year. Out of these and other nominees, which comics received the Comic Book Awards for November? I’m a pretty big fan of Steve McNiven’s work (Civil War, Old Man Logan, Uncanny Avengers). Even if I’m not buying the series he’s currently working on at the time, I can’t help but take a look through the comic just to satisfy my appreciation for his crisp, spectacular art. Thankfully he’s on the Uncanny Inhumans title for the time being and I look forward to every issue even more because of that. 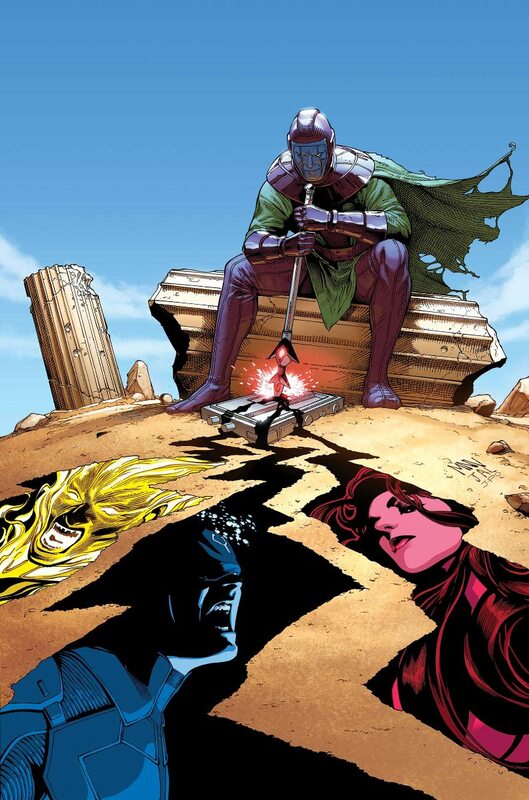 I wouldn’t say the cover for Uncanny Inhumans #2 is McNiven’s best cover offering by a mile, but what draws me to it is the perspective of the shot emphasized by Kang’s lurking, amused stare at those before him as he jabs the spear he’s wielding into the Inhuman device on the ground. How Black Bolt, Human Torch, and Medusa’s faces are erupting and crying from the residing cracks furthermore add to this image. This is also a great symbolic precursor to what transpires in the issue itself, which most comic book covers fail to do. Did I have a fun time reading Invincible Iron Man #3. The first issue of this series took home the award for Art of the Month last month and this issue does in November for the majority of the same reasons. Marquez and Ponsor deliver on many levels. 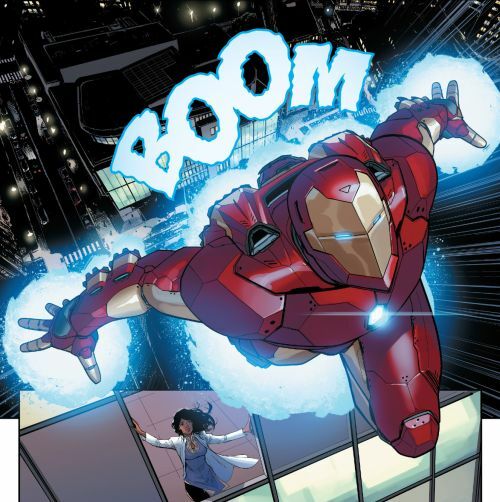 The slower, dialogue-heavy moments of Tony and Amara Perera come across just as great as the battle scenes between Iron Man and Madame Masque in this issue. The combination of both artists make for such a clean, pleasurable outcome and with how this book is looking I’m already becoming possessive of Marquez for this title, as I hope he doesn’t abandon the book in the recent future (by the looks of it, he’s jumping off after #5, however). Jonathan Hickman’s Secret Wars has been notably absent in the last few editions of my Comic Book of the Month Awards. With Secret Wars #7, the sluggish pace of the last couple of issues meets its timely end. Survivors of the final incursion were transported to separate areas on Battleworld by the magic of the now deceased Doctor Strange (Secret Wars #4) and from this dispersion these heroes/villains have convinced inhabitants of Battleworld that God Doom is not at all who he states to be, that there is room for doubt. This converges into an all-out war in the midst of Castle Doom and leads to an action-packed, engrossing chapter in this series. The only criticism I have would be how easily it seemed some of the population of Battleworld were convinced to turn on Doom, but it’s no substantial concern whatsoever. There is a nice touch of humor in Secret Wars #7 as well, a side to Hickman you usually only see in his creator-owned material. Overall, this issue capitalizes on what the series has been building to in fantastic ways, and with only two issues left, the epic end of Doom is surely nigh. You don’t even have to be an Ant-Man fan to appreciate the smarts inherent in this title. The Astonishing Ant-Man is a comic book to watch out for in all respects and issue two of the series is consistently a joy to read. Last issue, we learned that Scott Lang has ended up back in prison (poor guy) and we’re still on the outs of how that actually happened. We’re not given the answer in The Astonishing Ant-Man #2, but casually we’re getting a better hint as to what lead to his unexpected imprisonment. As the cover suggests, this issue mainly focuses on Scott’s relationship issues with his now ex-girlfriend, Darla Deering (a.k.a. Ms. Thing). They had gotten together when the Fantastic Four assigned a new FF team to protect the world when they decided to go on a family trip across the universe (more backstory can be found in Matt Fraction’s lame run on Fantastic Four/FF). This issue brings some closure to their relationship and does so within a humorously clever plot. The creative team of Nick Spencer and Ramon Rosanas is at its peak inAstonishing Ant-Man #2 through and through to the excellent final page and pages eight and nine show off some of Rosanas’ most creative work in the series. There is truly no ongoing Marvel comic book I could recommend more than The Astonishing Ant-Man as of this moment.